Active in the area of commissioning new music since 1988, the Universiy of Texas Wind Ensemble has offered world premiere performances of works by many composers including John Corigliano, Michael Daugherty, Donald Grantham, David Maslanka, and Dan Welcher. One of the guiding principles of the ensemble is contact with the leading musical minds of the twentieth and twenty-first centuries. Jerry Junkin conducts the Universiy of Texas Wind Ensemble, and is also the Artistic Director and Conductor of the Dallas Winds, and Music Director and Conductor of the Hong Kong Wind Philharmonia. Reference Recordings is proud to have released nine albums conducted by Jerry Junkin. Four outstanding wind band composers are represented on this album. 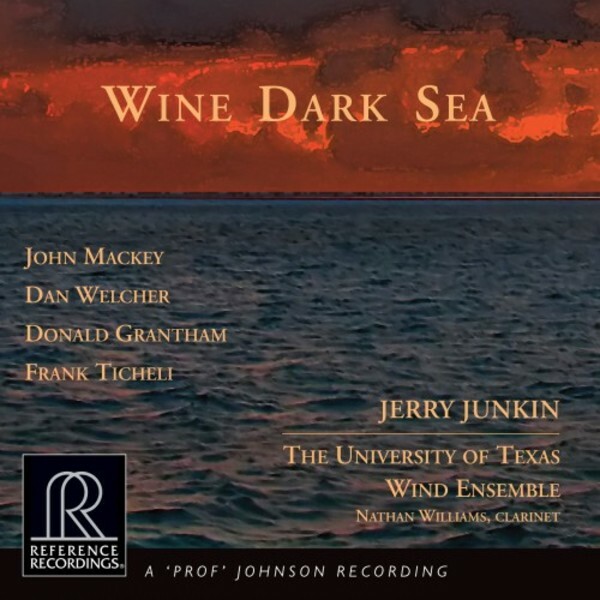 The title piece by John Mackey, Wine Dark Sea, is the world premiere recording of this important new work. Commissioned by the UTWE for the 100th Anniversary of the Sarah and Ernest Butler School of Music, it has been performed in front of ecstatic audiences and received raves around the world. Reference Recordings is proud to present it alongside important works by Dan Welcher, Donald Grantham, and Frank Ticheli. This is contemporary wind band music at its best, in extraordinary performances.